Think you have to stop job searching during the holidays because “no one hires” until January? In fact, New Year, New Job! 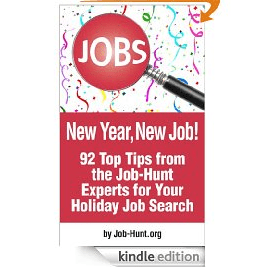 How to Use the Holidays to Advance Your Job Search, a 99-cent download on Amazon from Job-Hunt.org, will quickly convince you to accelerate your efforts right now. Getting in front of employers during November and December can yield surprisingly fast results. In fact, it’s often much easier to look for the perfect job NOW. As Job-Hunt.org’s LinkedIn for Job Search Expert, I’ve shared insights on the best ways to update your LinkedIn Profile, use LinkedIn to get in front of hiring managers, reach out to former colleagues, and other holiday-season insights (but they’re in this book only!). Your downloaded e-book includes cutting-edge tips on how to contact recruiters, enhance your personal brand, network at holiday parties, set up interview appointments, leverage social media, and other ideas, all customized to holiday job search in 2012 and beyond. Get your copy and start learning how to navigate the job search this holiday season.